Making the leap from learning about clinical procedures to doing them is less intimidating when the “patients” are fellow trainees—who generally approach the experience with good humor, knowing that the tables will turn when it’s their time to practice the same skills. This feeling prevails at the annual Procedures Fair at the University of Wisconsin School of Medicine and Public Health (SMPH), which gives students hands-on experience in many of the procedures that physicians, particularly in primary care, encounter daily. 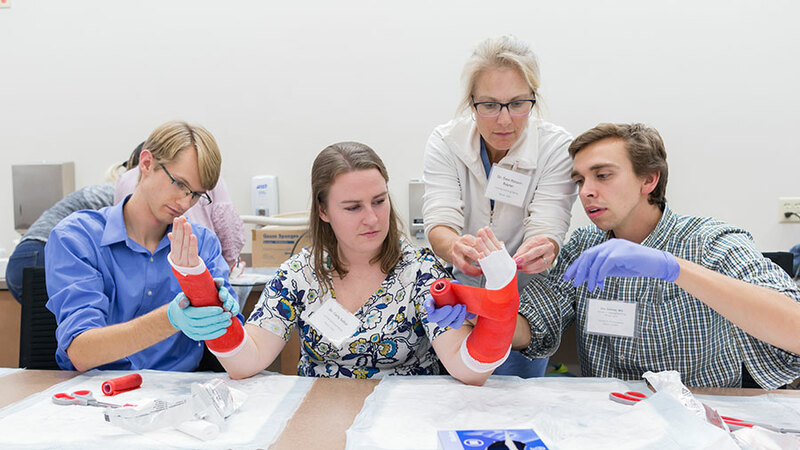 During a casting workshop, Danalyn Rayner, MD ’00 (standing), helps two SMPH students apply casts to DFMCH resident Carly Salter, MD. The 2018 fair—held on a November evening at the Health Sciences Learning Center—welcomed more than 120 UW-Madison undergraduate, physician assistant and first- and second-year medical students. More than 40 faculty members, residents, fellows, staff and volunteers—including third- and fourth-year medical students who had participated in previous years—served as teachers. Some are trained to act as mock patients for sensitive procedures, such as obstetrical ultrasounds. Anatomical teaching tools included traditional education models, along with more creative props, such as bicycle tire tubes, oranges, carrots and cocktail wieners. Maureen Longeway, MD, teaches a student how to perform a pelvic examination. Each enrolled trainee could choose two of 13 available workshops at the Department of Family Medicine and Community Health’s (DFMCH) now-signature event. 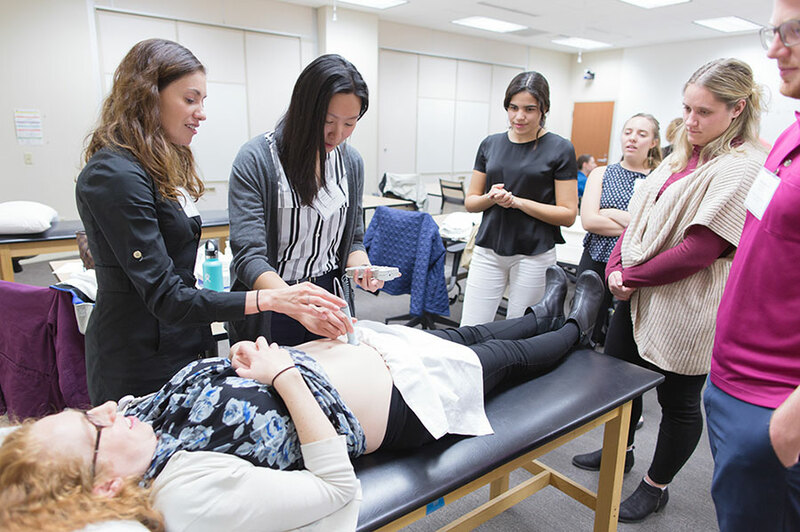 For example, in the obstetrics basics workshop, students learn how to “date” a pregnancy, use handheld Doppler ultrasound to detect fetal heart tones, check a laboring patient’s cervix and deliver a baby. In the suturing and IV procedures workshops, they review relevant anatomy, principles and techniques—and then have ample opportunity to practice those delicate skills. New this year were workshops on wilderness and rescue medicine, sterile technique and wound care, and EKG interpretation. 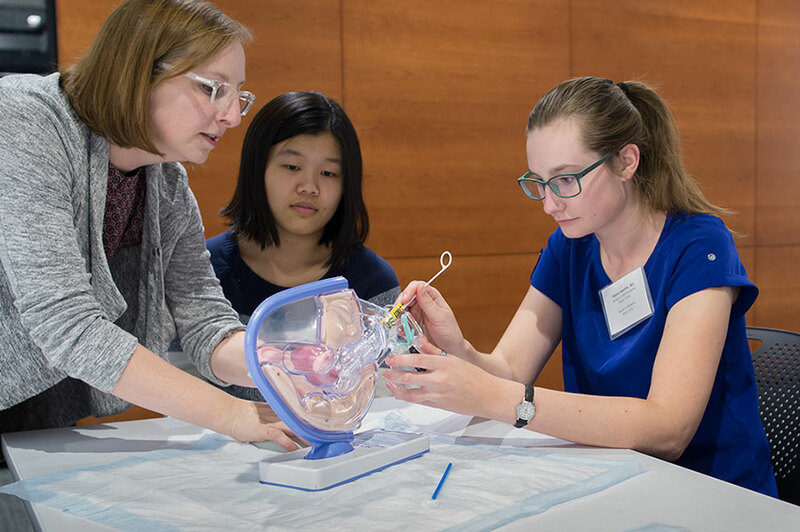 Planners aim to provide a low-stress, fun learning event, while also giving students the opportunity for one-on-one contact with faculty members and residents from the DFMCH. The Procedures Fair is sponsored by the DFMCH Office of Medical Student Education (OMSE), led by David Deci, MD, and the Family Medicine Interest Group (FMIG), led by a team of first- and second-year medical students along with faculty advisor Jacob Bryan, MD. Joyce Jeardeau, OMSE student services coordinator and FMIG staff advisor, oversees recruiting and organization for the event. Jacqueline Gerhart, MD (PG ’11) (left), demonstrates prenatal ultrasound techniques. The FMIG recently earned the American Academy of Family Physicians’ Program of Excellence Award for its exemplary efforts to grow and support interest in family medicine. It was one of 18 medical school FMIGs around the nation to win the award for 2018. This article originally appeared in Quarterly magazine.